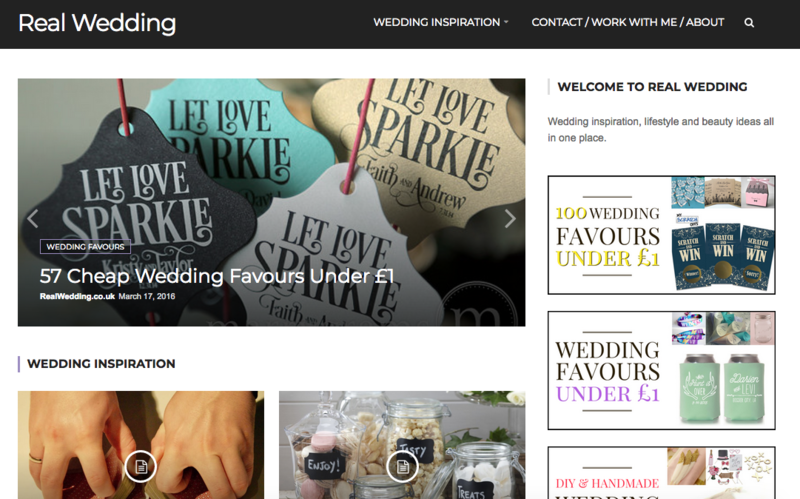 A great example of a Blogger Outreach success story is Realwedding.co.uk. A popular wedding blog, that specialises in providing inspiration for Brides and Grooms on a budget. Launched in 2010, the Real Wedding blog has a long history of providing useful content, but over the years, little has been done about improving their site metrics due to time and budget restraints. Since the site’s organic traffic to top pages is very strong, it’s also very seasonal. Consequently, to ramp up for the wedding season, Real Wedding have been using Get Blogged to increase traffic to their popular pages through organic search, and to improve domain authority. Create a better spread of backlinks across the website, including the homepage. Leapfrog a few major competitors in the wedding industry on page one of Google. Build the reputation of the blog. We were confident we could help with Real Wedding’s KPIs. Get Blogged’s range of trusted Bloggers and Influencers were the perfect fit for Real Wedding. The approach was clear. Engaging a spread of Bloggers and Influencers, Real Wedding set about getting a consistent spread of high authority blogs to feature them. Real Wedding were keen for Bloggers to share their content on their social networks, so that they could engage with them personally. Together with Get Blogged, they devised a plan to spread their budget to achieve as many assignments across the higher domain authority sites as possible. Especially relevant, within a few weeks of working with Bloggers to provide quality blog content and backlinks, Real Wedding were seeing improvements over all metrics! As a result, their top pages were seeing an improvement in Google rankings, which provided more traffic, therefore more clicks on affiliate links, and we know what more clicks means – more revenue. Furthermore, after 3 months of consistent Blogger Outreach (about 10 links per month) to the homepage and popular pages, the 5 top pages on Real Wedding have all ranked in the top 3 results on Google, with 3 pages in position 1. This Google Analytics graph shows more users visiting RealWedding.co.uk via search engines as the months go by. This graph shows sessions from search engines on RealWedding.co.uk – increasing due to a successful Blogger Outreach campaign with Get Blogged. This shows affiliate clicks have risen over the past couple of months, and continue to increase daily. Most noteworthy, Real Wedding do no other marketing apart from our Blogger Outreach campaigns. In conclusion, working with Real Wedding is great for our Bloggers, and we’re thrilled that this has turned into a Blogger Outreach success story. Not only has their DA soared, traffic has also improved, and has been providing them with a steady affiliate income. As a result, this income is now being put back into the business and is being used for more of the same SEO activity. Maybe you’re reading this as a potential client? Real Wedding are continuing to go from strength to strength, and most of all, experiencing an improved site authority, better rankings and more organic traffic as a result. This SEO activity has cost them less than you may think. Will you be our next Blogger Outreach success story? Take a look around. If you’re reading this as a blogger… more good news! Real Wedding are a regular client, therefore providing multiple paid blogging opportunities for Bloggers each month on Get Blogged. Sign up as a Blogger, here. For another Blogger Outreach success story, read all about dating website, We Love Dates.